So as always I am on a huge cleaning kick and made a new cleaning routine. But thanks to household cleaning products like Soft Scrub, I can cross certain things off my list. 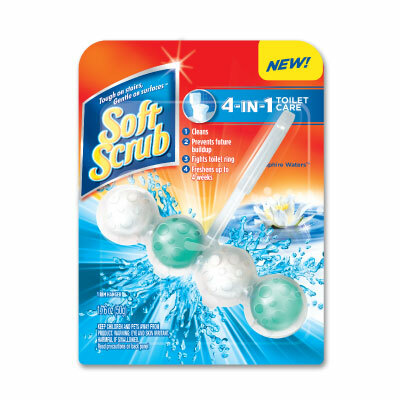 Instead of me having to scrub my toilet bowls every week and use cleaning products in them, I can let the Soft Scrub 4-in-1 Toilet Care do it for me! It actually has a unique design and advanced formula that does 4 things - cleans the toilet, prevents future build up, fights toilet rings, and freshens up to 4 weeks. That means I don't have to scrub the toilet because those rings will be fought off! I can not believe how great this smells and it makes the whole bathroom smell fresh and clean! I don't really like having to worry about what bathroom cleaner I should use when, so this takes care of all of my toilet cleaning problems. I can get them at Walmart for less than $2.00. It was so easy to hang in the toilet and it stays there without any problems. I can see it work everytime I flush the toilet and see the water rinse over it. The rings I had in my toilet are basically gone and nothing new has developed. My toilet bowl is looking shinier and cleaner already. I am so glad this is a rim hanger rather than a toilet bowl cleaner that has to go in the tank of my toilet. Oh, and the annoying toilet bowl stains I had were gone within a week. And this Toilet Care product literally lasted with it's fresh scent for 4 weeks! I always tell everyone to clean their toilets atleast once a week that way when unexpected guests drop by you never have to worry about being embarassed or rushing around to clean last minute! Be sure to keep up with the latest products on the Soft Scrub Facebook page! The Soft Scrub brand provided me with a sample of Soft Scrub 4-in-1 Toilet Care in exchange for a product review. However, all the opinions expressed here are my own.